An African river, a spectacular canopy of indigenous trees and sweeping vistas across the Kalahari grasslands of the Bwabwata National Park are the inheritance of the animals that roam here and the scattered bands of people who reside alongside them. You could wait a lifetime to experience closely a truly wild and untouched island of Africa. Situated in the Kwando River in north-eastern Namibia, Susuwe Island Lodge offers just this. The river's permanent water source nourishes its delicate ecosystems and sustains varied game and birdlife in the region. Lofty canopy viewing decks set amongst tall riverine trees overlook endless savannahs and glistening lily-studded wetlands. A firepit is embraced by a spacious lounge area and eclectic African art. Relaxation, privacy and comfort are paramount at Susuwe. A mouth-watering aroma, the clink of silver against china, the susurration of a wine glass filled - these are the joys of African alfresco dining. Fresh air sharpens whetted appetites and a picnic laid out amidst tall whispering grasses in unchartered territory illuminates your experience. The cool restful interior of just six personally attended suites, including wooden viewing platform and private plunge pool, is a haven of calm and respite, an airy dreaming space to recharge the senses. Professionally guided game drives are rewarded with special sightings of roaming elephant and buffalo, lechwe, lion, and leopard. A river cruise is preferable at sunset or sunrise and guided walks and night drives offer even closer insight into the intrigue of the African bush. We offer our visitors the opportunity to merge unhurriedly with Africa's timeless evolution of hazy days and star-studded nights. as well as buffalo, hippos, many antelope species, hyenas, lions and leopards inhabit this area. Horseshoe Bend is a unique attraction - an oxbow lake which has formed on the Kwando river. Double level viewing deck built into the forest canopy. Game drives and night drives in the Bwabwata National Park. 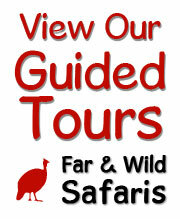 Guided walks which allow guests to view game, but with the emphasis on learning about the environment. or sunrise - to view game, birdwatch, fish, or just purely to relax. 220 volt AC electricity is supplied by generator, with standard South African three-point plugs in each chalet.